Alexa is another great online tools by Amazon, Alexa user to major a websites traffic and rank. We all know every website has own daily traffic and Alexa uses this tactic and gives an Alexa rank. This way we can determine How much a website is popular and which websites have Low Trafic or Zero Trafic presently. So you must be wondering how Alexa get millions of website daily page view data and organize them low to high rank? Actually, Alexa has their own toolbar that you can instead of into your browser. The magic part happens in Alexa rank by this toolbar. once websites visit by a user who has to install Alexa toolbar Alexa count it. So based on this count Alexa make higher to the lower rank of all websites into their database. And, again here I thing I want to add that Alexa is not any websites only, Alexa has premium websites competitor analysis service. If you have a blog or websites you can get your competitor data analytic report and get access of all keyword in which your competitor ranked for. Also Read: Online Form Filling Jobs – How to Earn 25K from your Home? How to Install Alexa Trafic Rank toolbar? It’s quite simple, below there is a link to get Alexa toolbar for your browser, as per your bower click there and there will be install option. Once you finished you have to restart your browser. Now you can see a new toolbar are spreading into your browser. How to Check Alexa rank of a website? Open the websites into your browser. You can see a blue Alexa icon, click over there and Check rank. There will be two type of rank will be shown there, Global rank and country rank (Like India). The global rank represents how much the website is a popular world based. And the country rank represents in which country the website is popular and show you the country rank. If you don’t have any Alexa toolbar installed into your computer still you can check Alexa by visiting Alexa websites. Put your website’s address and check a lot of more information on Alexa rank. How does Alexa help in Online Ad Posting Jobs? CYBER EXPO is India no Online jobs provider where you can start classified ad posting jobs on the based of daily payment. While we managing our Classified advertisement jobs we have the problem of zero traffic website, We found that it’s really difficult to find which classified websites have low traffic rank. Posting ads on those low traffic website will generate low earning both CYBER EXPO and Members. So We use Alexa toolbar to check classified sites rank. We found that posting ads from 1-500,000 ranked websites is really helpful to good ravines from Google ad posting jobs. So we recommended our member to post ads on those sites Alexa rank from 1-500,000 in globally. Sometimes checking Alexa rank one by one is painful when you supposed to check thousand of classified sites list for doing ad posting work. 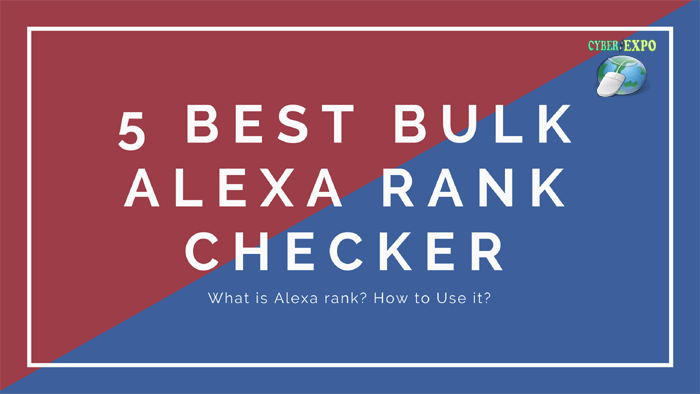 So here is top 5 bulk Alexa rank checking websites where you can check up to 1000 classified sites global and Indian rank with in minutes. Go to Any of below websites (We recommended bulkseotools.com ) and paste your website’s list. Now click on submit button. It takes few minutes to check all of the websites ranks. Once is finished you can copy the data in your clipboard or download the CSV files.